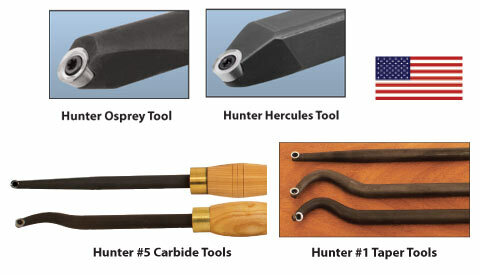 The Hunter Tools are good for making boxes, goblets or bowls and small vessels. They feature a round Nano Grain carbide cutter that will cut for up to 100 times longer than high speed steel before it needs replacing (depending on turning conditions). When the cutter starts to dull, loosen the screw and rotate it to a fresh edge. This can be done 4-6 times before replacing the cutter. During use the cutter is held at a 30˚ to 45˚ angle for best results. The Hunter cutters for each tool are held in place with a Torx Head Screw. A Torx wrench is included with each tool.